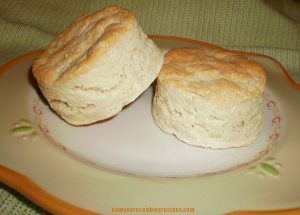 Gluten-Free Buttermilk Biscuits - Now....you're cooking! I love breakfast “sandwiches” made with egg, cheese and bacon or ham in a biscuit. I made these buttermilk biscuits for that purpose. 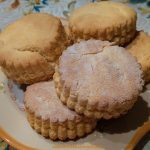 I probably made these a little larger than I would if I was making them as a side dish, and I ended up with 7 biscuits (well, 6 1/2). 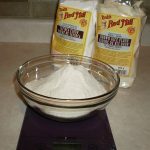 I used this gluten-free flour mix. Place flour, sugar, salt, baking powder and baking soda in food processor bowl. Whirl to combine. Cut butter into chunks and add gradually to food processor through feed tube while processor is running. 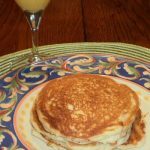 Continue to process until it is finely cut in and mixture is crumbly. In a small bowl, whisk egg until frothy, and add buttermilk. Pour buttermilk mixture into the feed tube while processor is running, and blend a few seconds until it is combined and forms a ball. Turn out onto work surface lightly dusted with your flour blend, or rice flour. Roll out to about ¾ inch thickness. Use cookie cutter to cut biscuits of desired size. Place biscuits on parchment lined baking sheet. Bake in preheated oven for about 12 to 15 minutes, until nicely browned.